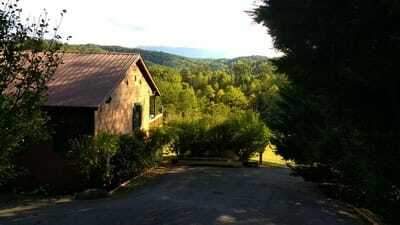 Welcome to Stonecreek Cabins in the Smoky Mountains of Tennessee. We are a privately owned and operated overnight rental cabin company located in between the popular cities of Gatlinburg and Pigeon Forge TN . We are minutes from the Gatlinburg Arts and Crafts Trail and 10 miles or less to everything these 2 popular destinations have to offer. 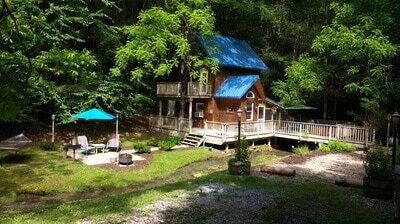 We have recently been "Featured on Frommers" as one of the top destinations in the country ,and under the Gatlinburg TN slide, Stonecreek Cabins been selected as a a "Unique,secluded cabin experience"
Reserve one of our 3 cabins, the Creekside, Treehouse (Pet friendly after Aug. 10th) or Mountain Magic and enjoy being in your own private paradise. Relax and unwind from the stresses of everyday life and enjoy the incredible peace and quiet that only being in your own secluded cabin can bring. No matter which of our 3 very different settings you choose, you will step into an immaculate cabin that has been personally prepared just for your arrival. We do things very differently here at Stonecreek Cabins. We are the only cabin company that treats our guests to many free extras that you won't find anywhere else. You'll be amazed at the way the cabin has been set up just for you! When you step into your cabin,you will hear soft music playing and a complimentary chilled bottle of wine or a non-alcoholic sparkling beverage on ice. In the kitchen,there are makings for S'Mores and more. Chocolates are on your pillow and the lights are dimmed to create a wonderful cozy atmosphere. and you have finally arrived in one of Stonecreek Cabins highly rated rentals. Each of our private cabins has its own personality and amenities and you will want to try them all. Choose the Creekside for a wonderful 2 story cabin for 2 (4 max) built across the sparkling creek. Imagine yourselves in your own private and secluded cabin located on 30 acres of park like beauty and get set to just relax....or get ready to enjoy all that our area has to offer. If you decide to stay in, you can enjoy being in your own private space. Fire up the grill and have a Bar-B-Que ,roast marshmallows for S'Mores ,enjoy a game of Corn-Hole or just soak in your private hot tub and just enjoy your beautiful surroundings. All 3 of our cabins have fully equipped kitchens to prepare a wonderful home cooked meal or if you want to just relax, your cabin is just a short drive from many fine restaurants. If sightseeing is more to your liking, hop in the car and take a short drive to action packed Pigeon Forge ,Dollywood or Gatlinburg for loads of attractions, fine dining,music venues ,white water rafting,fishing,hiking or having a wonderful picnic in the incomparable beauty of the most visited park in the United States, our own Great Smoky Mountains National Park. There are numerous Moonshine ,Whiskey,Wine and Beer tastings around the cities of Gatlinburg and Pigeon Forge. Visit Ripley's Aquarium of the Smokies, Anakeesta on the Parkway, Christus Gardens,Sweet Fanny Adams Theater,Ober Gatlinburg Tramway or our own Gatlinburg Space Needle for an amazing view of the city and mountains. All of this may sound too good to be true........but it isn't. 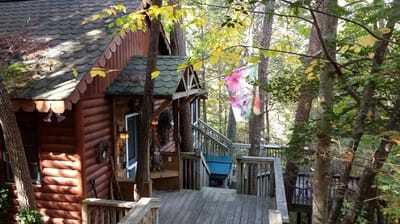 Our cabins truly are what you always imagined and dreamed a Smoky Mountain getaway could be. Sit back,relax and enjoy your hard earned vacation. We will work with you to insure that this vacation holds special memories and that you will want to return year after year to one of our special cabins. Stay in one of our cabins and experience blissful peace and quiet. All 3 of the cabins are located away from the hustle and bustle of the city,yet only minutes from all the excitement you could hope for. This beautiful area truly has something for everyone and you could easily spend weeks here and barely scratch the surface. Come for a visit and stay a while........you'll be glad you did.